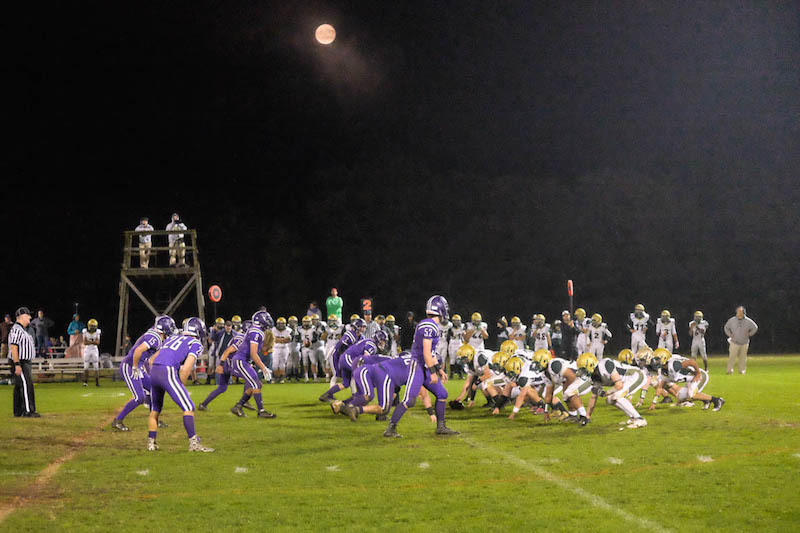 Under a full moon, the Vineyarders shut out Greater New Bedford for the last game of the season. 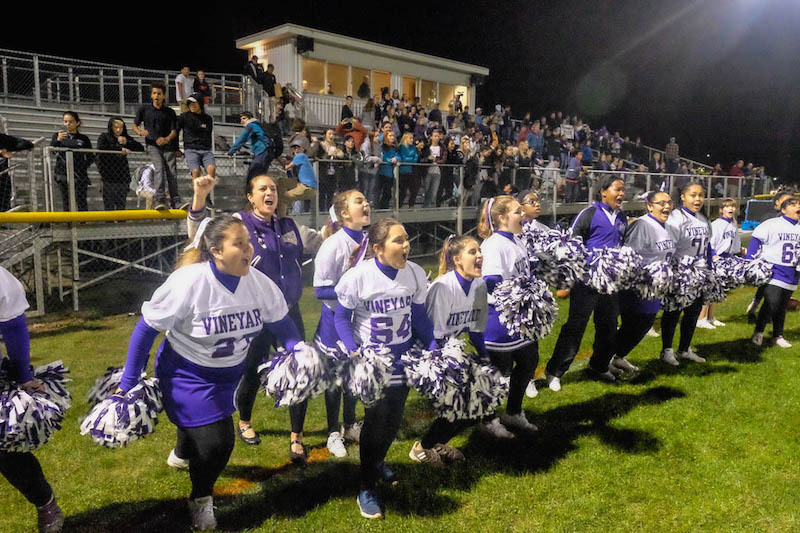 An inspired Martha’s Vineyard Regional High School football team scored two first quarter touchdowns Friday night, and held off Greater New Bedford Vocational Technical High School the rest of the way for a 14-0 victory in the final game of the season. On an emotional Senior Night, senior quarterback Zachary Moreis threw a 56-yard touchdown pass to fellow senior co-captain Cooper Bennett for the first score, then ran for a 55-yard touchdown, both in the opening minutes of the game. On Wednesday, school administrators announced the team would shorten the season by forfeiting the final two games, including the traditional season ending Island Cup rivalry against Nantucket. With a roster severely depleted by injuries and disciplinary dismissals, the school said it acted in the interest of safety for the players. Head Coach Ryan Kent said the disappointment of ending the season early was on the minds of the players as they took the field for their final game Friday night. Students and parents left the stands and rushed the field to congratulate the team after the game ended. The Vineyarders are now 2-7 on the season, and will finish the year 2-9, once the next two forfeits are recorded. Even though this year's team record was not a winning one, those players that stayed the course, are winners. Being a part of a team, especially football, teaches values and lessons that go far beyond the scoreboard or playing field. Congratulations to the coaching staff for their commitment to the players and the program. VINEYARD FOOTBALL will be back! this is soooo sad, what are the kids going to do now? I hope they stay out trouble and away from drugs, drinking etc.